Infused with anti-microbial, anti-bacterial silver for a CLEAN finish! Green SilverClean Interior Detailing Towels are the microfiber towel of the future. Infused with advanced anti-microbial, anti-bacterial, and anti-odor silver, Green SilverClean Interior Detailing Towels leave more than just a CLEAR surface, they leave a CLEAN surface. The stitched edging and 80/20 polyester, polyamide blend is clear-coat safe and has more uses than you can even think of. Microfiber has long since been known as a superior cleaning cloth, first being used as a household cleaning agent. However, thanks to a streak-free, lint-free finish, microfiber has shot to the top of the car detailing charts as well. Perfect for wax removal, polish removal, glass cleaning, and pretty much every aspect of detailing, microfiber towels are needed every step of the way. Green SilverClean Interior Detailing Towels are just another towel to sweeten the deal. Infused with silver, a powerful antibacterial agent, Green SilverClean Interior Detailing Towels will change the way you wipe down a car’s inner panels. There’s a reason many detailers use gloves and face masks when detailing a car’s interior – it can be dirty work. Dropped food and spilled drinks can breed mold, and sometimes accidents happen while taking a ride with your favorite furry friend. 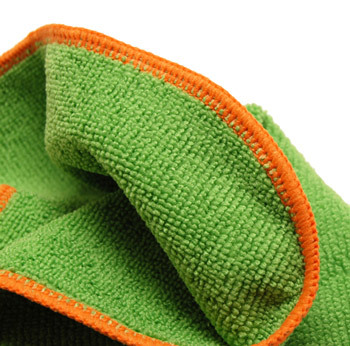 At stitched edging makes the Green SilverClean Microfiber Towel safe for any surface! A lot of your cleaning power comes from the products you’re using, but why not amp up that power and leave a perfectly clean finish by using specialized microfiber towels? Green SilverClean Interior Detailing Towels will do just that. Silver is a powerful antibacterial cleaning agent that actually prevents the growth of germs and kills bacteria before it can become something more sinister. In addition to it’s awesome anti-bacterial properties, Green SilverClean Interior Detailing Towels are super soft, with a 80/20 polyester/polyamide blend and a stitched edge, both of which will leave no swirls or scratches behind. While Green SilverClean Interior Detailing towels were designed for interior use, they’re also great for a quick removal of wax or polish. Use McKee's 37 Microfiber Cleaner to wash your towels and you'll be amazed at how long they last! Don't worry, multiple washings will NOT affect the silver's antibacterial capabilities. Use Green SilverClean Interior Detailing Towels on more than just your car’s interior panels. The anti-bacterial properties make the Green SilverClean Interior Detailing Towels perfect for cleaning kitchens, bathrooms, children’s toys and play rooms, and any other surface that would benefit from a germ-free clean.